Harshit Saxena (born 21 August 1985) is an Indian composer. His debut was as music director for the Murder 2 film. Saxena won the Upcoming Music Composer Award in 2012 at Music Mirchi Awards for his song "Haal-E-Dil" from Murder 2. Harshit Saxena was born on 21 August 1985 in Lucknow, India. His father, Abhilash Saxena, is a retired Sub- Divisional Officer in BSNL, Lucknow. His mother, Vandana Saxena, is a housewife From Varanasi. Saxena is a trained physiotherapist BPT. Harshit Saxena has participated in a number of reality shows, and he was a finalist in Amul Star Voice of India, Jo Jeeta Wohi Super Star, and Music ka Maha Muqqabla. He also appeared in the first two seasons of Amul Chhote Ustaad, and he performed the song "Happy Ending" in Tees Maar Khan, directed by Farah Khan. He was the music director for Mukesh Bhatt's Murder 2, He composed and sung the song "Haale Dil" in it. 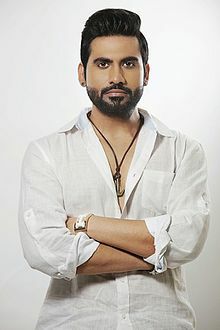 It was nominated for several awards, and Saxena received the “Best upcoming Music Director” Award for Murder 2. He also worked as a composer for the movie Hate Story in 2012 and for Super Nani in 2014. He wrote and performed songs for both movies. In 2015, he performed the song Meet Me Daily featuring Anil Kapoor and Nana Patekar in the film Welcome Back. His debut album is planned for 2016. Harshit Saxena lives in Mumbai since 2007, He is unmarried. ^ "All you want to know about #HarshitSaxena". ^ Saxena, Harshit. "Best Upcoming Music Composer". ^ "Harshit Saxena rocks in 'A Hate Story' - Times of India". 8 "Beginning of a bright career".